Set on 2 acres, Sea'Scape is a cozy 1 Bedroom cottage with a livingroom/kitchen, a full bath and separate bedroom featuring a king size bed overlooking the eastern harbor on MOW. 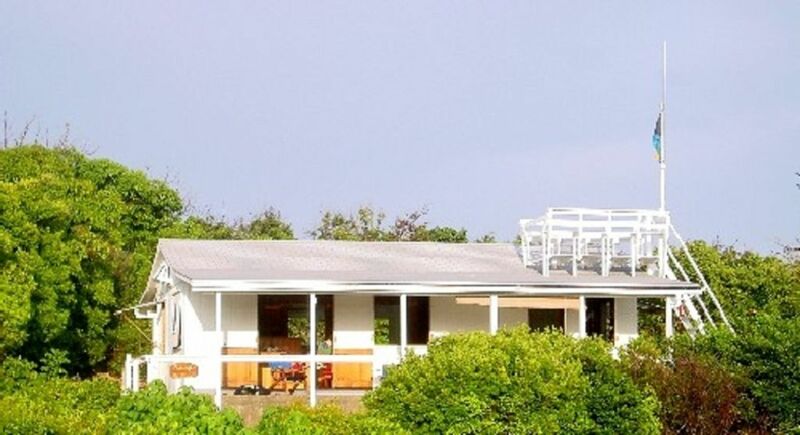 The Snuggey is a separate 1 bedroom & bath guest house on the hill overlooking the back side of the island and the barrier reefs with gorgeous sunrises from the expansive porch. There's a deep water dock (about 4 ft at datum) and it's a short walk to the small private beach located harbor-side. A 16' whaler is available for use as well (for an extra charge). Amenities: Main: full kitchen, all appliances, laundry service available, bathroom with shower, marine band radio, cell phone,small Weber charcoal grill, large porch with picnic table, bedroom with king bed. Guest house: king or 2 single beds, bathroom with shower, large porch overlooking sea. We are the third generation of McMaths and Herrings to enjoy this spectacular setting on the eastern harbor on Man O War. My grandfather, Neil McMath and his good friend Bill Lee, were some of the first Americans to discover the island and its people. If you're looking for a quiet getaway, away from the crowds of tourists who frequent the Bahamas, like to fish, swim, find an interesting place for lunch and most of all just relax, it doesn't get any better than this. While you'll spend most of the day outside, either on the porch, on the beach, in the village or, if you have a boat, off-island exploring, at the end of the day, you'll have a comfortable place to come home to. The main house sleeps 2 adults very comfortably and 2 couple of kids can be added by making the living room couches over to beds. The Snuggery, a 30 yard walk up the hill, is the perfect guest house with a king size bed or two singles, along with a full bath and a view of the ocean reefs and the sunrise that captures the spirit of the Bahamas. The small beach is perfect for small children who want to play in the sand or try their luck at snorkeling. There's also waterfront access on the "back-side" a short walk from the end of the path. Sea'Scape is an easy 1/4 mile walk down the "Queen's Highway" from the village of Man O War. Sea'Scape is from sea to sea .... From the Harbor to the shore overlooking the reefs. The property includes 200 feet on the harbor and 200 feet on the the eastern ocean front. The property includes a full deep water dock (4ft at mean low tide) sufficient for the ferry to land at all tides and for 20-35 foot power boats in general. Wireless Internet Services Available through www.OII.net Weekly cost is $40.00 Longer terms are discounted accordingly. Contact OII or log into http://wireless.abacoinet.com for instructions. Man O War Cay is located in the Abacos, one of the Bahamas' premier out-island tourism areas. The Cay is a 10 minute ferry ride from Marsh Harbor, the largest town in the area and the location of the region's airport.